Telling the story of Australia as it is today, Gabrielle Chan has gone hyper-local. In Rusted Off, she looks to her own rural community's main street for answers to the big questions driving voters. Why are we so fed up with politics? Why are formerly rusted-on country voters deserting major parties in greater numbers than their city cousins? Can ordinary people teach us more about the way forward for government? In 1996 - the same year as Pauline Hanson entered parliament - Gabrielle, the city-born daughter of a Chinese migrant, moved to a sheep and wheat farm in country New South Wales. She provides a window into her community where she raised her children and reflects on its lessons for the Australian political story. 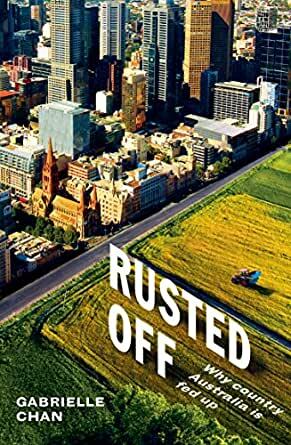 It is a fresh take on the old rural narrative, informed by class and culture, belonging and broadband, committees and cake stalls, rural recession and reconciliation. Along the way, Gabrielle recounts conversations with her fellow residents, people who have no lobby group in Canberra, so we can better understand lives rarely seen in political reporting. She describes communities that are forsaking the political process to move ahead of government. Though sometimes facing polar opposite political views to her own, Gabrielle learns the power of having a shared community at stake and in doing so, finds an alternative for modern political tribal warriors. A big story from a small town.